Publisher: Little Brown & Co, Boston, Massachusetts, U.S.A.
At the point in her life when things should be easy, Greta's house and her hands are full.Greta's grown daughter, Elizabeth, has just arrived in town with her son and her boyfriend to write a screenplay based on Madame Bovary. Greta's mother, Lotte, has progressed far beyond being 'a character' since her husband died, taking ever increasing amounts of Greta's time and patience. And, most surprising and unnerving of all, Greta has fallen in love.Not with her sweet and devoted husband.But with someone who appeared unexpectedly through a side door and turned her life upside down. SHE IS ME deftly portrays the wisdom, pain, and huge reservoirs of love that are intertwined through the lives of women. Knowing each other as only mothers and daughters can, these three weave a sweet-hearted comedy out of their mistakes, shortcomings, and attempts at growth.This is the hilarious and heartbreaking book that admirers of The Love Letter and Cathleen Schine's other acclaimed novels have long been waiting for. 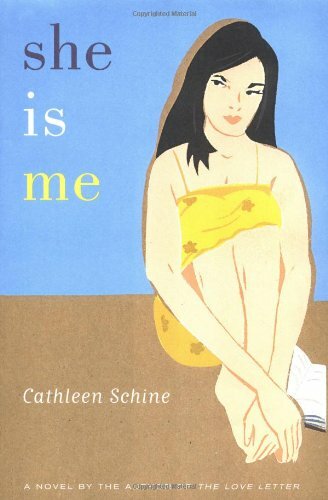 Cathleen Schine, the author of The Love Letter, takes on the "sandwich generation" in her tale of three mothers, She Is Me. Regal, cranky Lotte is the matriarch of the trio, mother to Greta and grandmother to Elizabeth (who also has a child of her own). All three points of view are presented in the novel, as each of the women struggles with her personal demons: Lotte has a quickly spreading skin cancer, Greta also has cancer and is beginning to question her heterosexuality, and Elizabeth has uprooted her life to write a doomed screenplay based on Madame Bovary. While the trepidations they face are daunting, Schine keeps the tone light and humorous throughout, capturing the complicated nature of mother/daughter relationships--specifically the peculiar way in which they can loathe and love each other at the exact same moment.